Launched in 1990, the Hubble Space Telescope should continue to work through 2025. SEATTLE — Despite recent issues with one of its instruments, the Hubble Space Telescope is expected to last at least another five years. A new report suggests that the iconic spacecraft has a strong chance of enduring through the mid-2020s. "Right now, all of the subsystems and the instruments have a reliability exceeding 80 percent through 2025," Hubble mission head Thomas Brown of the Space Telescope Science Institute in Maryland told Space.com. Brown presented the results of the engineering report on the telescope's reliability here at the semiannual meeting of the American Astronomical Society on Jan. 10. "[WFC3] will come back to science, but we want to do it carefully," Brown said. After the telescope's 1990 launch, Hubble's primary mirror was diagnosed with a flaw that produced fuzzy images rather than the crisp photos needed for science. Fortunately, the spacecraft was designed to be serviced by astronauts. Thanks to their intervention, and a set of replacement instruments that could correct for the error much as a pair of glasses can correct a person's vision trouble, Hubble has sent beautiful images back to Earth for more than 25 years. One reason the spacecraft has lasted so long is that astronauts have provided aid. Servicing missions continued to update the telescope until 2009, when the space shuttle was retired. The final update to Hubble included the installation of two brand-new instruments, the Cosmic Origins Spectrograph (COS) and WFC3. The astronauts on Servicing Mission 4 also performed on-site repairs for the telescope's two other instruments, the Advanced Camera for Surveys (ACS) and the Space Telescope Imaging Spectrograph (STIS), both of which had stopped working. The astronauts additionally replaced Hubble's 18-year-old batteries with new ones; installed six new gyroscopes, whose job is turning the telescope; and added a brand-new Fine Guidance System to point the instrument. Astronauts also covered Hubble's equipment bays with insulating panels and installed a device that will help to guide the observatory down when its mission comes to an end. Even after 10 years in space, WFC3 and COS still have all of their backup systems online, which should help to extend their lifetimes. "If the redundancy systems are [as] reliable [as the primaries], we can still get plenty of years out of them as well," Brown said. ACS and STIS are both older than WFC3 and COS and have already implemented some of their redundancies. Still, Brown expects those older instruments to continue working well into the future, pointing out that both were rated at greater than 80 percent reliability. 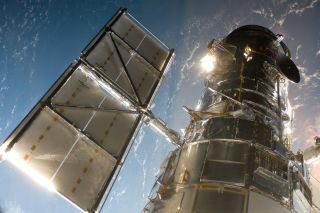 The report estimated the iconic Hubble's reliability after examining components on the ground that have experienced similar wear and tear. But despite that prediction, it's still possible for a major accident to end the spacecraft's mission prematurely. For instance, in late 2018, Hubble had issues withone of its gyroscopes. The telescope's team was able to resolve the issue without switching to a backup system. Brown said that even if they hadn't been able to fix the malfunctioning component, the team on the ground had come up with other ways to keep the telescope functioning. Hubble's orbit is stable until the 2030s, Brown said. When that orbit begins to decay, the spacecraft will be deliberately crashed into Earth's atmosphere, where Hubble will burn up before it touches the ground. But for now, while WFC3 is down, Hubble's other three instruments will continue to explore the universe. "There's plenty of science in the queue to keep the telescope busy with the other three for the foreseeable future," Brown said. Follow Nola Taylor Redd on Twitter @NolaTRedd. Follow us on Twitter@Spacedotcom and onFacebook. Original article on Space.com.